With the number of pens in my collection growing substantially over the last few years, I’ve put them all together in an Airtable database as an attempt to keep them in some sort of order. Although the database is far from complete, and will perhaps be the subject of a post in its own right — my thoughts came around to the blog and how things are organised in terms of the pens and reviews I’ve put up so far. I’ve decided on at least creating a basic pen index list for the blog, which will hopefully provide readers with a general idea of where I’m coming from as far as my fountain pen thoughts and opinions are concerned, along with a simple index with links to the posts I’ve managed to get around to writing so far. Looking at the list, I feel incredibly fortunate to have the pen collection I have, which was largely brought about by a very kind and generous friend downsizing his own collection at about the same time. Although I’ve thanked him many times, it is a generosity that I will never be able to fully repay. There are certainly some pens in the list I find myself coming back to, filling, and using more often, though at the current time I’m not ready to either put them in rank order or into a best/top type list. Perhaps that might come at some point in the future. At the current time I’ve also limited things to fountain pens, having not decided on the exact nature of how I might include other types of pens I own without the index becoming a little too all-encompassing and unwieldy. 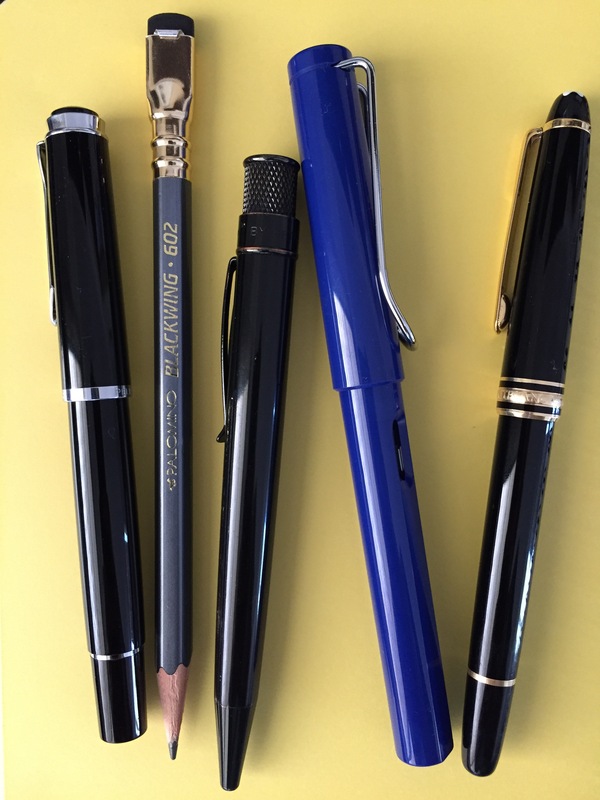 I also debated on whether to include budget pens such as the Pilot Petit1 and Platinum Preppy, however having written a post on the Petit1, the decision was made to include them as well. After all, there are some solid pens at this end of the market, particularly at the price point they sell for. As I’ve mentioned, the list contains links to posts I’ve written on some of the pens. If you are looking for other reviews around the web, the best place to start is the magnificent Pennaquod pen blog search site run and maintained by Ian Hedley, of Pens! Paper! Pencils! And the Airtable database I mentioned in the introduction above? 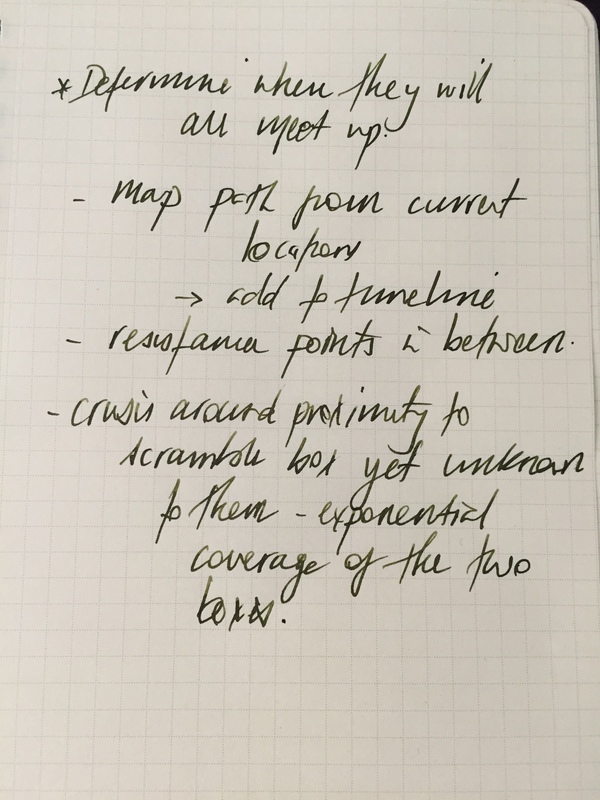 That’s not a database — check out the one David Brennan of Too Many Inks uses for his pen and ink rotation. Now that’s a database. In closing, I do hope to slowly get around to transforming more of the index to links, however of course that means finding time to write the posts. I’m sure I’ll get there — eventually. Time, money, objects, advice — to name but a few. Generosity can be demonstrated in many forms. You might usually find greater expression of it amongst friends and family. Between complete strangers? Perhaps less often, yet a little more likely where there are common interests. What follows below continues to amaze me as I write and read through it, yet also reinforces to me there are some wonderful people out there, and I have been indeed lucky enough to recently become acquainted with one. Readership of this blog has built slowly and steadily over the two years I’ve been writing here. I do receive feedback occasionally on what I write — not a lot — but enough. Some offer encouragement, others push me to think a little differently about what I have written, though it is always well-intentioned and respectful. I consider myself very lucky in this regard. 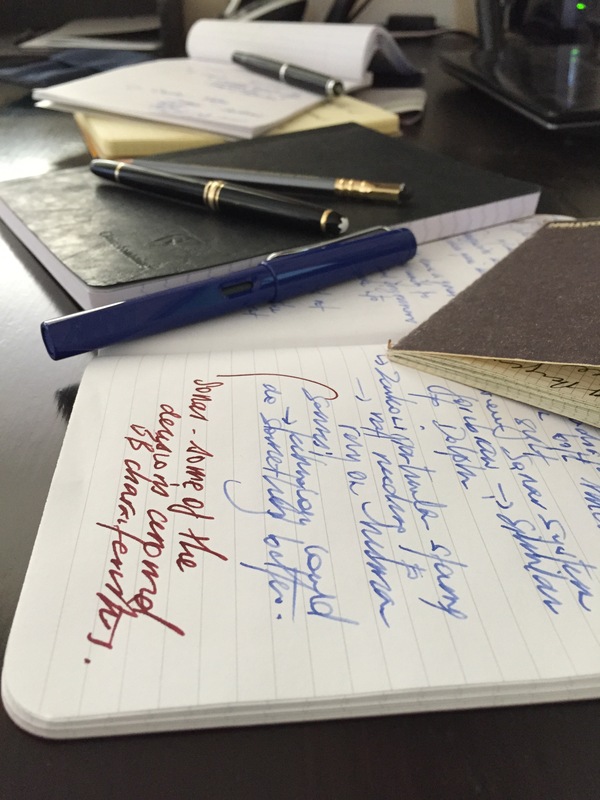 Earlier this year I received some kind words from a reader on a couple of my pen related posts. I of course responded with thanks as is usually the case. Thankfully, he also reached out via email, through the contact page of this blog. What the email contained is something I’ll never forget. Earlier in the year I had concluded I would be satisfied with my current pen collection in the short-term — and convinced myself I wouldn’t be making any significant purchases (perhaps only a bottle of ink here or there) until the second half of the year. Not long after, I received the email which contained an offer I must admit left me somewhat stunned upon my initial reading. I know what you are thinking — the email contained an unbeatable deal and I broke my current and future planned budget restrictions all at once. No. It was much more than that. Way more. 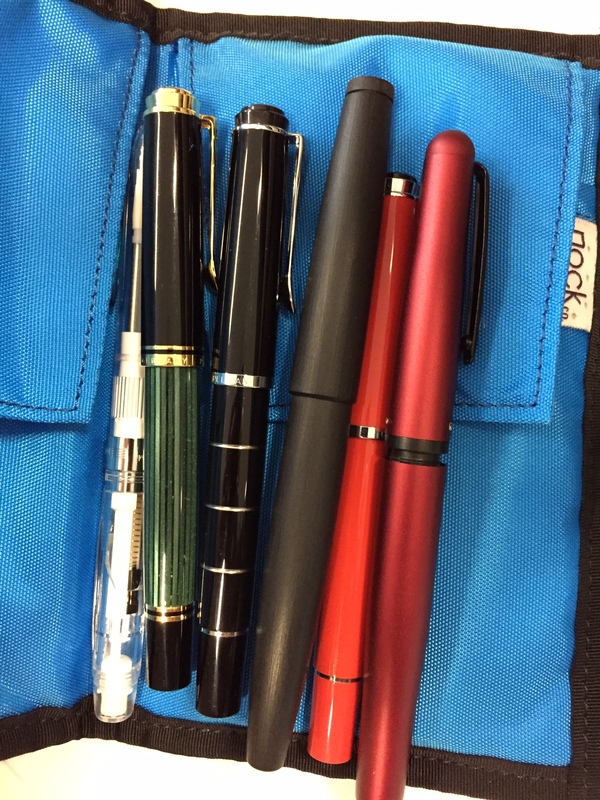 The writer of the email mentioned owning a number of pens, and considering himself a user rather than a collector — was looking to pass on some of the pens he no longer regularly used to someone who might use and appreciate them. Somewhat more significantly for myself, he went on to say he enjoyed reading this blog and would like to do something to support that. Very kind words and encouragement which in themselves already more than made my day. Being offered these pens was… well — you can imagine how that felt. The list of pens here was nothing short of amazing — particularly to someone like myself looking to expand a fairly limited collection. An endeavour that was to date progressing — though fairly slowly. Remember we are talking about doubling my fountain pen collection overnight — with each of these pens worth more than any (bar one) I already owned. Needless to say I was somewhat flabbergasted. A few emails back and forth later — and I had provided an address for the pens to be sent. A little excited at this point. Needless to say, an exciting few days wait ensued before an express post package arrived at my desk in the office. Being the somewhat private person I am, waiting until people were off in meetings and such for a quiet time to open it was one of the hardest things I have done in recent times. Although through the previous email exchanges I had known what was coming — actually having them in my hand was unbelievable. At no cost to me, I had just received: a Pelikan M400 (green; EF nib); Pelikan M215 (black and rhodium; M nib); Pelikan M205 (red; F nib); Lamy 2000 (F nib); Tombow Object (red; F nib); Platinum Multi-pen; and a selection of ink cartridges. I think anyone familiar with pens will see the value in those above, and anyone who isn’t — well let us just say we are looking at a significant amount of money if I were to buy them. 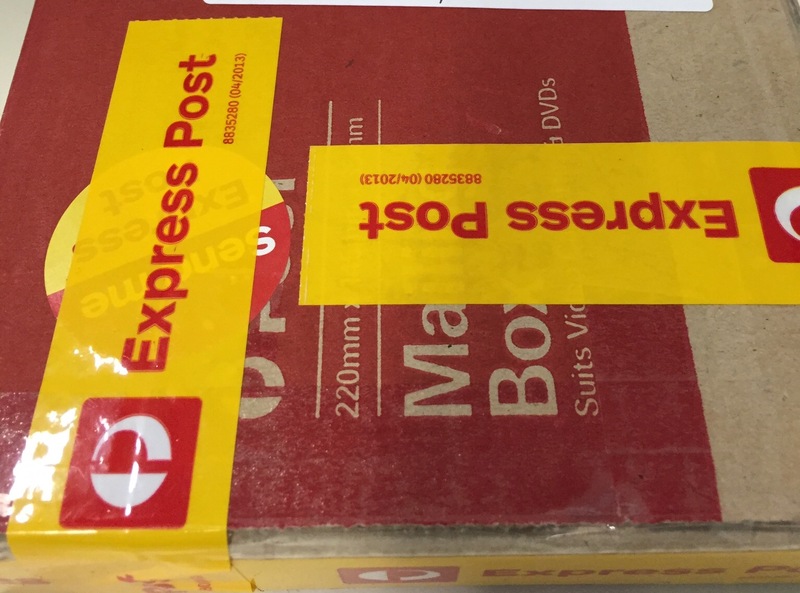 Having received the pens in the middle of March, I have only now been able to sit and write some thoughts on this act of kindness, with the extent of my good fortune having finally sunk in. To me, it goes way beyond the monetary value which can be calculated from the list above. The kind gentleman who made contact can certainly be assured the pens have been warmly welcomed into my collection, and no amount of thanks could ever be sufficient, though I will indeed give it my best shot. He has made no money, has no blog, Twitter or Instagram account to link back to — and even if there were – I get the impression a link would be politely declined. Also, my query as to whether he wished to be mentioned by name, and to read this post before it went up — politely declined. To me, it is a very real reminder of the kind and generous people in the world (and within the pen community) that we may never see nor hear from. Or at least if we do, not often. These are the people I write for. As this piece of writing nears conclusion, something else has struck me you know. I mentioned time and advice in opening of this post. Two very valuable things I have also received far more of from this kind gentlemen than I’d ever hope to receive, and to that end, I look forward to each and every email. As far as this generous gift I have received? I can only hope that someday — if I am in a similar position – I would do the same, but it mightn’t be with any of these particular pens. No, these I’ll likely be keeping as reminder of the immeasurable kindness and generosity that still exists in the world. With so many words to be written this month as part of my first foray into NaNoWriMo, I feared this blog would be a little forgotten over the coming weeks – and no, I had not planned ahead well enough to have written and scheduled posts in advance. In a rare moment of wisdom, I came to realise my best chance of putting something up on the blog would be to combine the two. That is, participate in NaNoWriMo, and occasionally blog about participating in NaNoWriMo. I plan to write a few more NaNoWriMo flavoured posts throughout the month, which is of course assuming the weight of expectation that comes with a 50,000 word target doesn’t crush me first. So, with a tip of the hat to yesterday’s Fountain Pen Day, today I thought I would share some of the analogue tools I have been using to help plan out, and hopefully get written, the 50,000 words that constitute the NaNoWriMo challenge. Various notebooks, pads, scraps of paper and even the odd dreaded yellow Post-It Note have all played their part here. Although I have the overall plot and story outlined, my fear of running out of specific ideas to keep filling scenes, has resulted in a litany of places with either paragraphs, a line, or even a single word jotted down to avoid forgetting that great idea. Though I must admit, the more common scenario seems to be noting down why events written two chapters ago no longer make sense given the turn the story has taken. This whole novel-writing thing is certainly not easy! 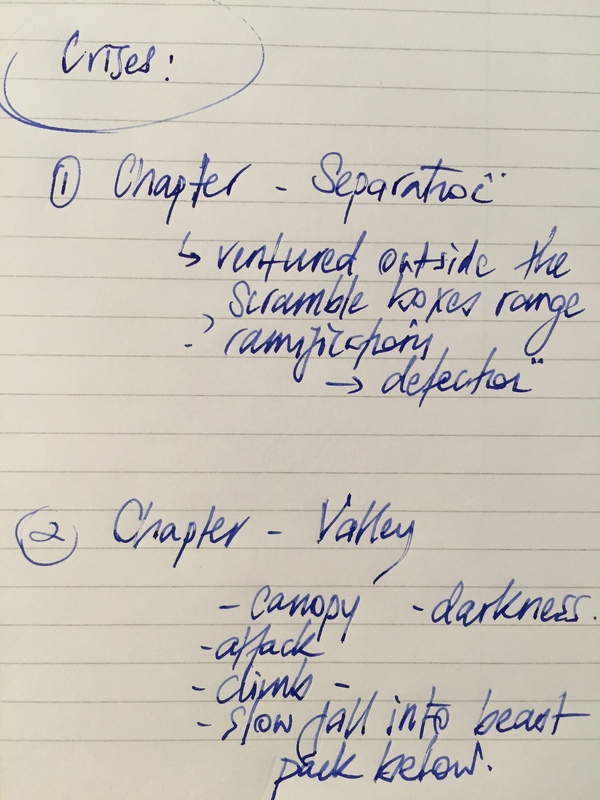 I have found using inks of varying colours quite helpful when going back through my notes to either check off ideas or plot lines I have implemented into the story, or in highlighting areas that may require more thought or detail. The Montblanc Meisterstuck inked with Burgundy Red has been particularly useful given it’s contrast to the Safari’s blue ink, clearly showing notes made as additions to the originals. 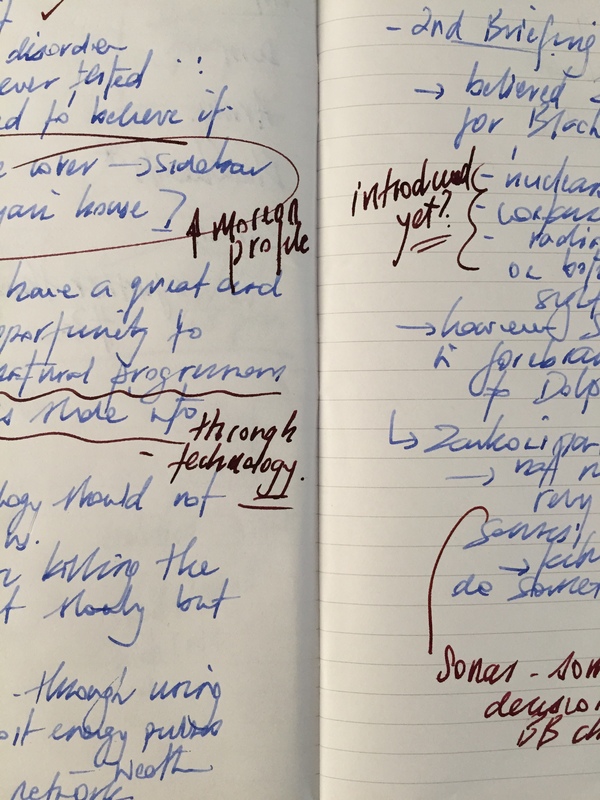 The most used of the items outlined above is probably a combination of the Field Notes Arts Edition notebook, the Lamy Safari for note taking, and the Montblanc Meisterstuck for marking up the Safari’s notes. The Field Notes became the notebook of choice early on as I my initial intention was to keep all of my ‘NaNo’ notes in the one book, and the majority have ended up in here. I found the larger ‘Arts’ edition the ideal size for more extensive notes, yet small and light enough to carry with me. 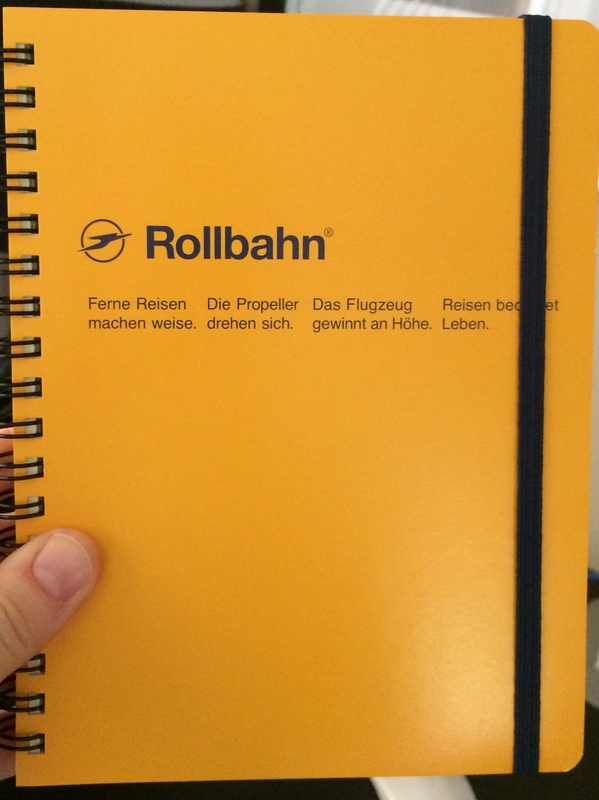 The Delfonics Rollbahn notebook contains great paper stock for fountain pen use, however the yellow colour is not the best shade to highlight any particularly vibrant inks you may be using. Certainly not a problem for the darker blues and blacks if that is your preference. The Safari was not necessarily my first choice pen, however is only a fairly recent purchase, and the paper based planning of this project seemed a great chance to test it out. No real complaints here, except it has been a little ’skippy’ occasionally, however I put this down to not having given it a thorough clean before inking it up after purchase. I am really enjoying the Daniel Defoe Palm Green ink, which is now residing in the Pelikan M205 (EF). Again only a recent purchase, however what a great colour! I am sure it will see quite a bit of use throughout the remainder of November and beyond. My main (and only minor) grievance has been the extent to which the Safari Blue Ink has faded. Although most likely due to both the ink and Field Notes paper (the same amount of fade was not evident on the Rhodia stock), I would have preferred it to maintain the vibrance it had when first laid down. With my word count currently just over the 10k mark, I am finding this an extremely interesting challenge. I was falling on the side of “maybe I’ll just do it next year”, right up until a few days before November 1, however would perhaps have continued to say the same thing every year had I not bitten the bullet and entered. Gotta go. There’s an important word count that needs increasing!! …guests can download the NEXT Hotel Smart App, using it to adjust lighting, room temperature, music and television channels without needing to leave their super comfy bed. 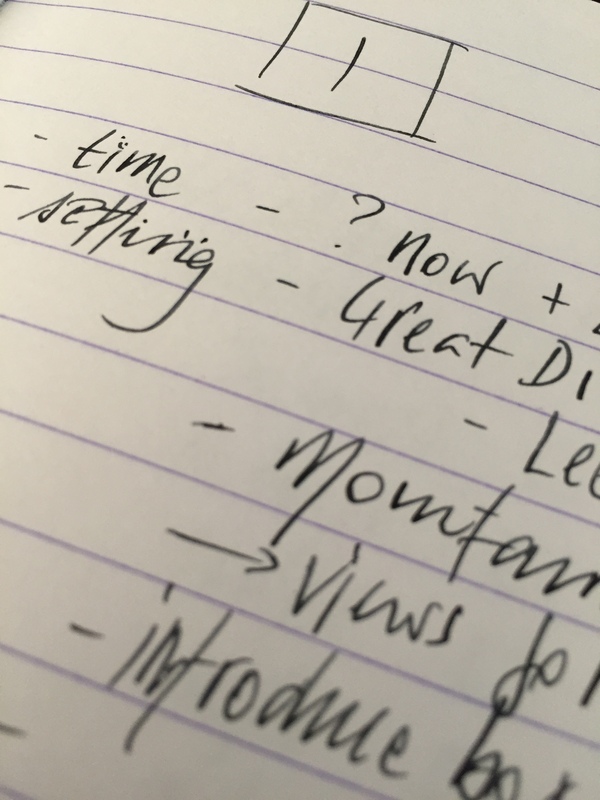 But even on OS X, where apps have always had ways to work together, I had to manually copy and paste the title and body of this piece from the Evernote, erm, note where I scribbled my initial ideas into Write. Like an animal. As much as I am a fan of Evernote, it’s a tedious, hindering experience that makes me curious about alternatives.